After a ten-hour flight on Virgin Atlantic from London Heathrow, we arrived in Nairobi at 7:00 in the morning. 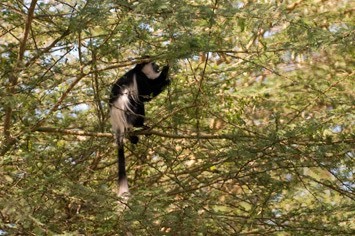 Twenty degrees in Nairobi was very pleasant, considering we left Europe with temperatures around freezing! 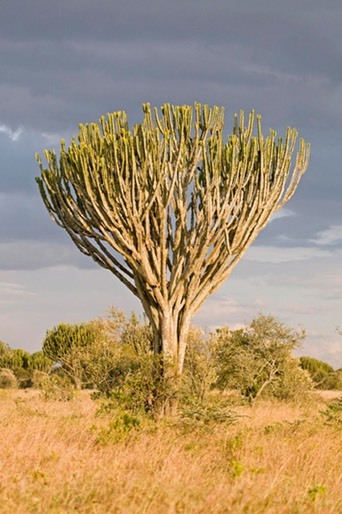 And given its altitude, Nairobi isn’t the warmest place in Kenya, so we had warmer climes to look forward to. A delivery driver from Erikson Rover Safaris (www.roversafari.com) and Charles, the cook we had hired for the duration of our trip, met us at the airport. He welcomed us with a big and rather toothless grin. When we saw the car in the car park, we were slightly shocked, as it was already crammed to the roof with camping equipment, and that was before we even attempted to put any of our bags into it! The car was a 27-year-old two-door Range Rover with two roof hatches. After a lot of pushing and shoving we managed to squeeze in our two bags and two backpacks full of camera gear. Then we faced the challenge of not only fitting Charles into the car, too, but also the driver who needed a lift home to one of the Nairobi suburbs! The two guys ended up squeezed together in a space smaller than the width of one seat. We set off in the direction of Karen, a leafy suburb where the rich and the white (“muzungus”) people live. There are well-stocked supermarkets there, where we could find all we would need for camping in the bush. It turned out that Charles was a truly lucky find, as he had already prepared a shopping list. He had, basically, decided already what to cook for the first few days. So he just made sure that we were happy with his choices and asked us to add anything else that we wanted to have. That was great, because we would have blundered around the supermarket in a bit of a daze, after a night with little sleep on the plane. Given the size of the shopping trolley that we filled up, there was just one question: how should we fit all this into the car? After squeezing the food in and dropping off the driver, we headed towards Nakuru. 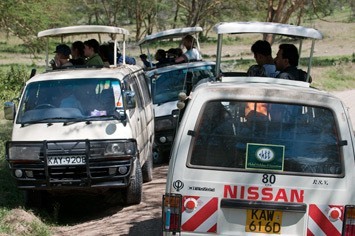 The road from Nairobi to Nakuru is very busy, and we were among the slowest of all vehicles. Not surprising with the amount of stuff we had loaded! The traffic was pretty manic, with people overtaking even at the most impossible places and just expecting that everybody else would make space for them. And worst of all were the matatus, the small mini-buses. Whenever we spotted one coming up fast in the rear view mirror we knew we had to be extra careful. 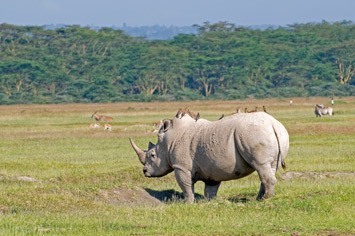 Nakuru is the fourth-largest city in Kenya and lies in the Great Rift Valley. 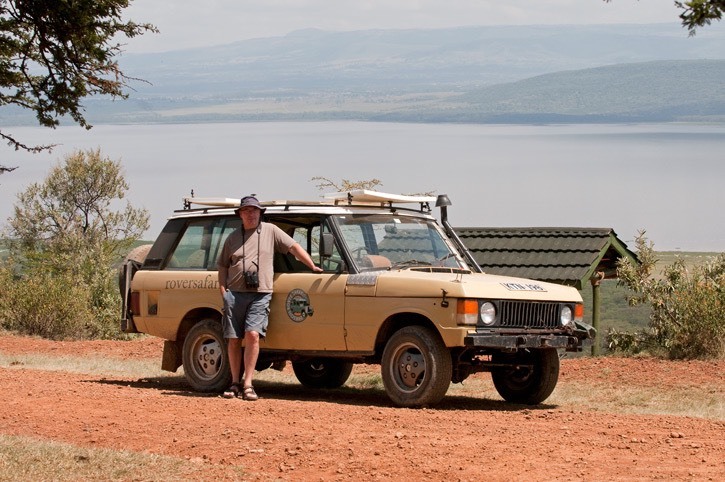 Coming from Nairobi we had to climb down the escarpment, which offered fantastic views over the whole valley. 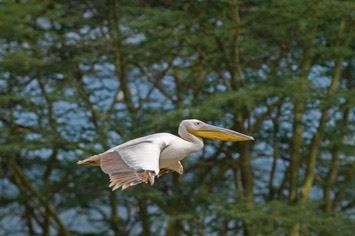 After about four hours drive we arrived in Nakuru, where we headed for the National Park that cradles Lake Nakuru. 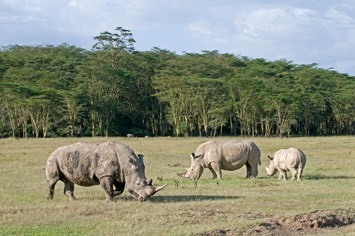 We had our first game drive on the way to the campsite, when we saw our first white rhinos, for which Nakuru is these days famous. 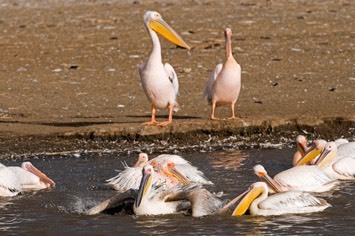 The public campsite at Makalia Falls is at the very southern end of the park. It had showers, but the toilets were only of the “hole in the ground” variety. When we arrived at the campsite, we were the only people there, so we had a free choice of where to pitch our tents. 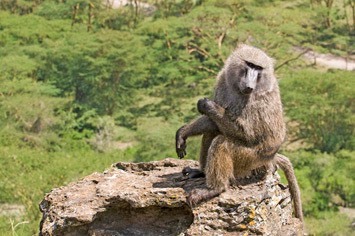 While setting up camp, we saw the first baboons lurking about; a species almost as devious as humans, and one that is known to steal food from unsuspecting campers - it is most unwise to underestimate them. 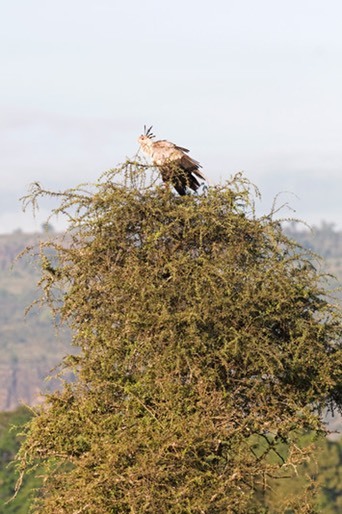 We kept a vigilant eye on a big daddy baboon, but, while we did that, one of the smaller ones sneaked up to our food box and grabbed a packet of dried pasta! 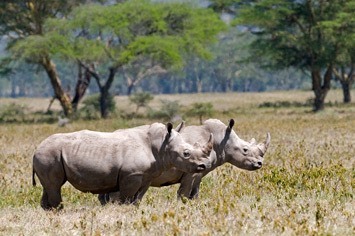 Welcome to the bush! 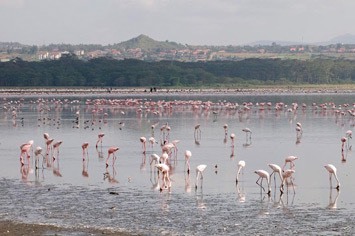 Lake Nakuru is a soda lake, well known for its large numbers of flamingos. 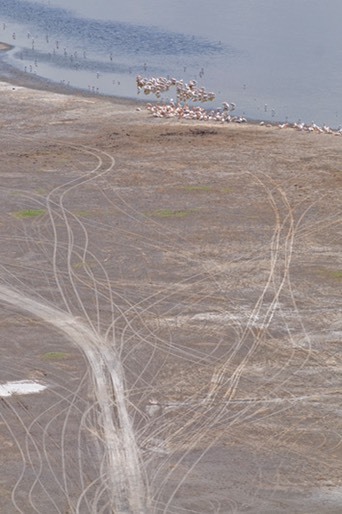 During our stay in the park we got to see quite a lot of flamingos, but apparently most of them had moved on to Lake Bogoria, another of the Rift Valley lakes. 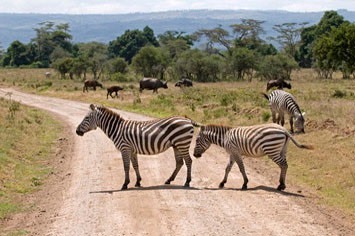 Nakuru National Park is surrounded by fencing, as it is situated in very close proximity to Nakuru town. 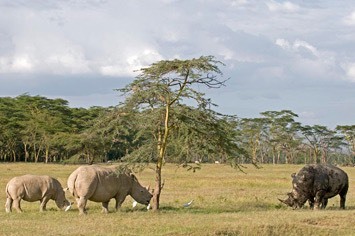 But although not a very natural feature, at least the fence ensures the protection of strong populations of animals, which make this park a great place to start a safari. 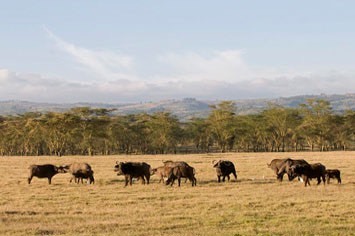 On our first morning, we left the campsite early and immediately came across a large herd of buffalo in the early morning light. 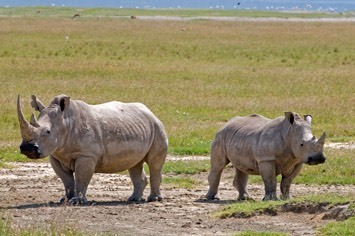 We drove to the lakeshore, where we soon found our first rhino of the day. 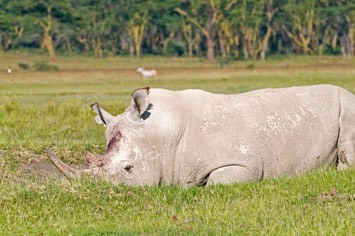 He had some injuries, probably from a fight with another rhino, and he appeared to be feeling rather sorry for himself. Most of the time he just lay on the ground, not moving much. 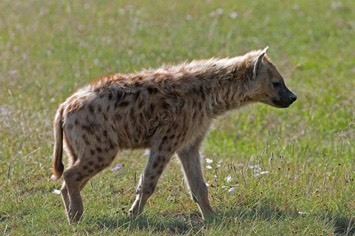 A short distance away we came across a family of spotted hyenas; with mum and dad resting in a mud hole and the pups tucked away in the higher grass, which made them nearly invisible. 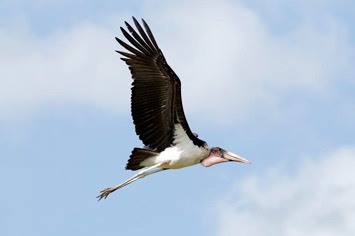 There were also plenty of marabou storks, flamingos and pelicans on the lakeshore, and at one point we could get out of the car to photograph them close up. 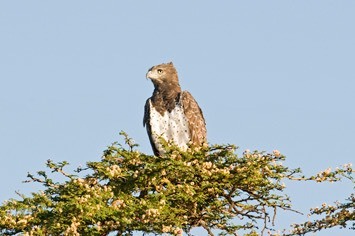 We also saw hamerkops and a beautiful martial eagle. 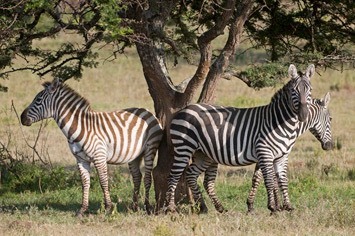 We spent some time watching a herd of zebras, which seemed to be arguing with each other all the time, and there were also Impalas, Thomson’s and Grant’s gazelles around. 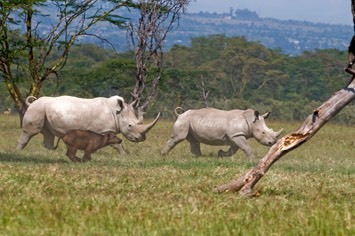 Later we came across a mother white rhino and her calf in among a herd of buffalo. 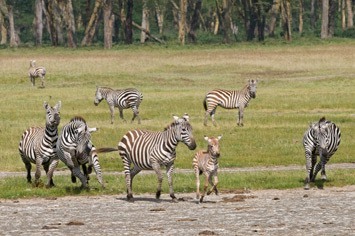 Something spooked them and suddenly there was a huge stampede right next to our car! 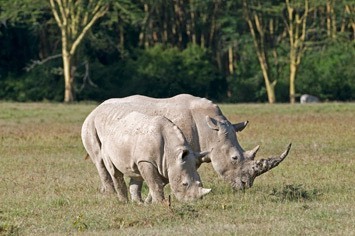 When the animals had calmed down again, the two rhinos posed for us for a while. After exploring the lakeshore, we drove up to the viewpoint on Baboon Cliff, where we were immediately greeted by some of the baboons. We enjoyed great views over the northern part of the lake and the National Park. 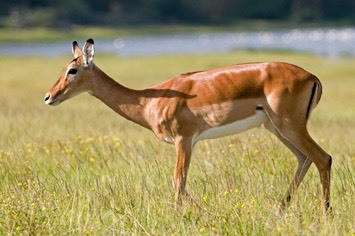 On the way back to the campsite, we passed many impalas, zebras and more buffalos in the wooded areas. After a welcome, delicious lunch and a siesta in camp, we headed out again in the afternoon, this time to the eastern shore of the lake. 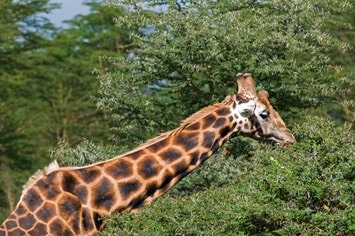 We watched a herd of zebras at a small waterhole and then found our first Rothschild’s giraffe. 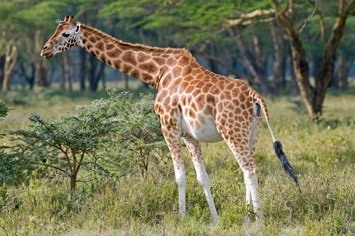 This subspecies of giraffe is endangered, and a number of them are kept in the safe confines of Nakuru National Park. Soon after, we got a tip-off by the driver of a safari van, who told us that a leopard had been seen nearby and gave us detailed instructions on how to get there. 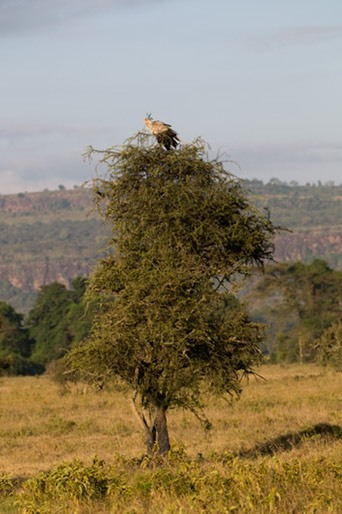 It wasn’t too difficult to find the spot, as there was a large number of safari vans congregated there, all staring at a fairly well hidden leopard in a tree. 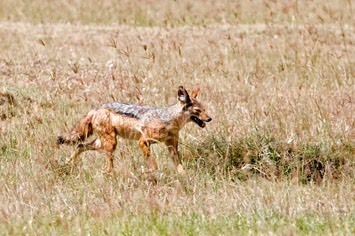 After a while he came down and disappeared in the dense grass. 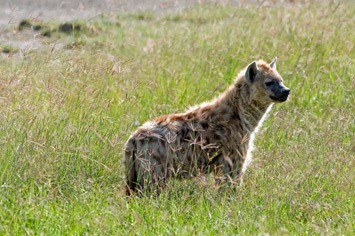 Nevertheless, we were very pleased to have seen a leopard on our first full day on safari! 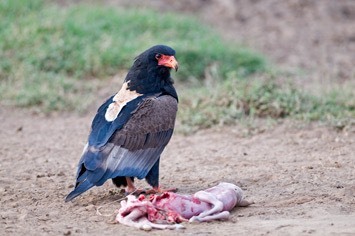 On the way back to the campsite we came across a bateleur feeding on a small, dead animal. 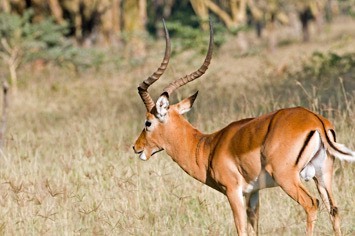 It appeared to be a stillborn buck, and we were wondering if it was a waterbuck, as we had seen a female waterbuck at this spot only a little while earlier, when we passed there on our way to see the leopard. 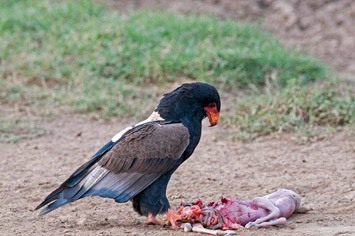 It was a rather gruesome sight, as we watched the eagle tucking into its prey. 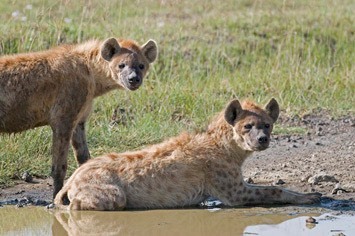 Back at the campsite, we found that we had new neighbours: Tal and Gus, a young couple from Nairobi. After dinner we took a bottle of duty-free whisky over to them and spent the evening chatting away. 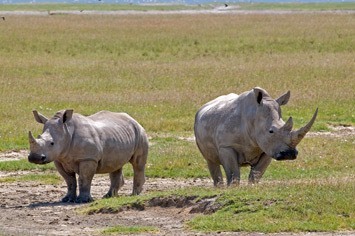 It turned out that Tal works for the David Sheldrick Wildlife Trust, where they raise orphaned elephants and rhinos. 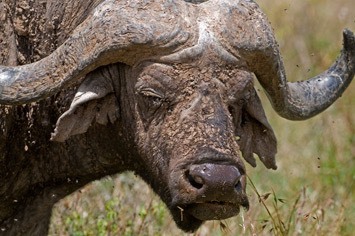 Suddenly, we could hear lots of snorting, and discovered that a big herd of buffalo was making their way to Makalia Falls – just in between our tent and us! As we were cut off from our tent, we stayed for another glass of whisky. 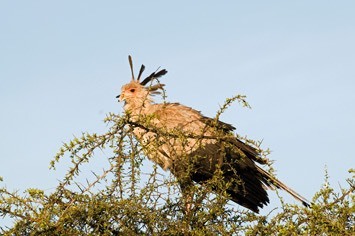 The morning game drive started with the rather unusual sight of a secretary bird up in a tree. 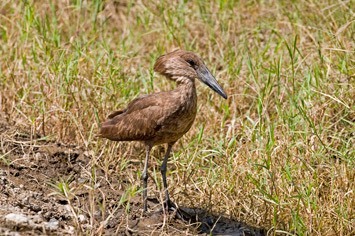 They are odd-looking birds that normally walk on the ground looking for snakes to eat. 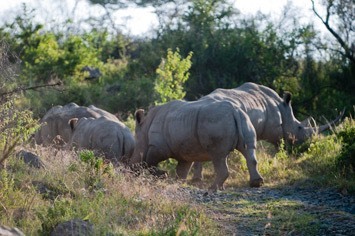 We decided to head up onto the hills on the eastern shore of the lake, and to our surprise we suddenly saw the rear ends of five white rhinos ahead of us! 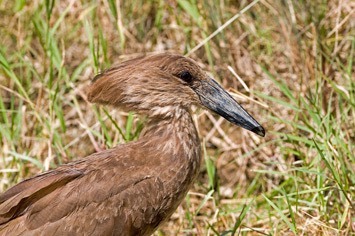 Unfortunately they disappeared into the bushes beside the track very quickly and were soon lost from sight. 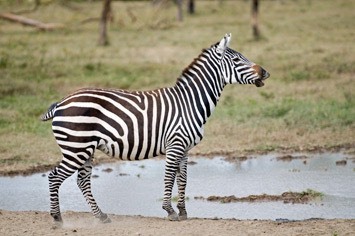 Afterwards we enjoyed some great zebra and buffalo encounters. 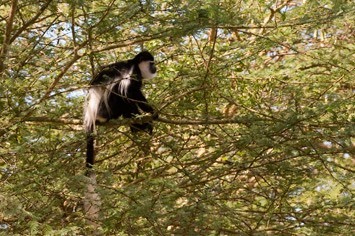 In the forested area next to the lake we suddenly came across some black and white colobus monkeys up in the trees. That was certainly a very nice surprise! 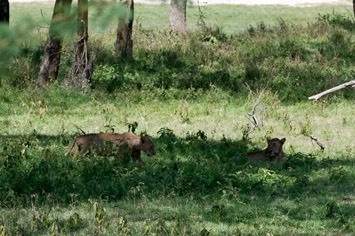 While we watched the monkeys, a safari van driver told us that there was a sighting of lions not far from us. Again, it was not difficult to find them, due to the number of vans speeding past us in that direction. There were a large number of vans all parked near two sleepy lionesses. 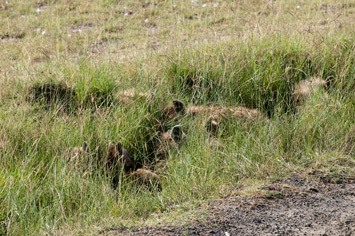 We stayed for a while, hoping that they would wake up and do something, but they didn’t even notice when an unsuspecting warthog walked to within a couple of metres of them! 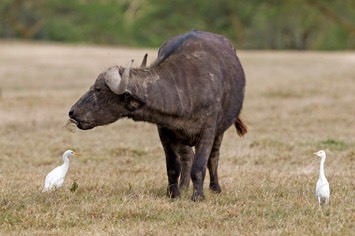 That was one very lucky warthog! 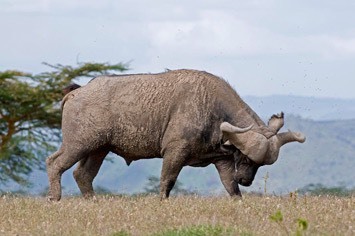 On the way back to camp we came across more buffalos, a black-backed jackal trotting past a small group of zebras and a couple more rhinos. 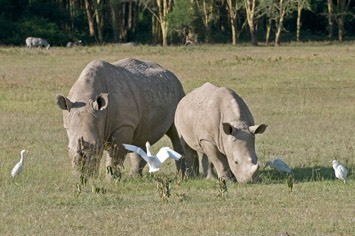 The afternoon game drive brought more of the usual suspects, but our most exciting sighting was of three white rhinos. 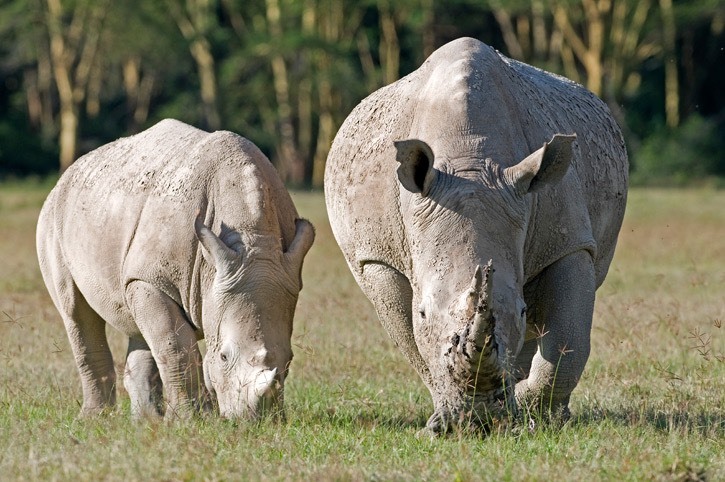 A mother and her calf were grazing near the track and were soon joined by a big, mud-caked male. 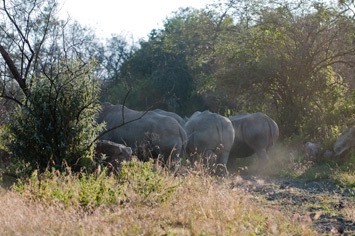 At times they were very close to our car, but fortunately, white rhinos are normally rather docile, not like their cousins the black rhinos, of which we thought we glimpsed one in the bushes. 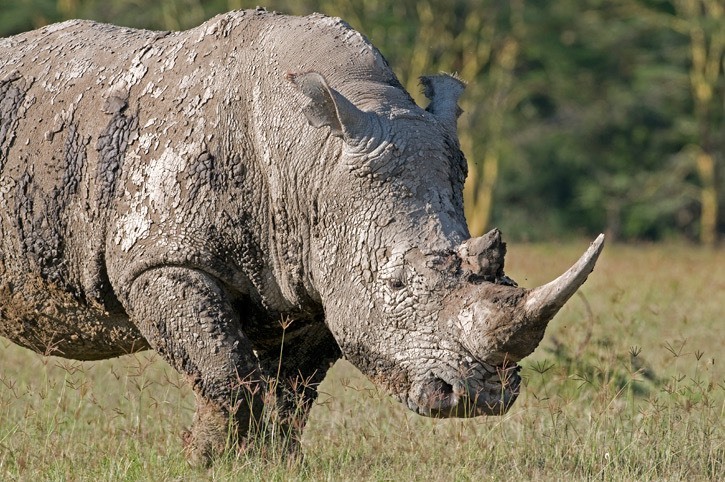 The rhino sighting was a great end to our stay in Nakuru and we were very pleased with what we saw during these two and a half days. 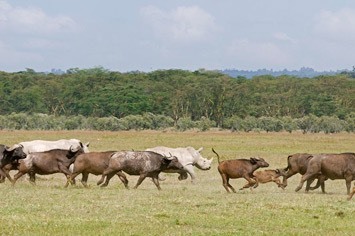 We managed to spot all the mammals that can be seen in larger herds: buffalo, impala, Thomson’s and Grant’s gazelle, zebra, waterbuck and warthogs. 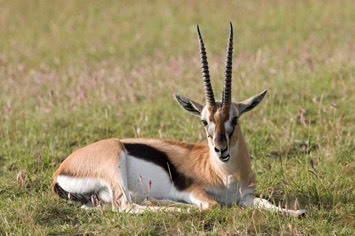 Furthermore, we also encountered some of the endangered Rothschild’s giraffes, as well as spotted hyenas and black-backed jackals, and, of course, the leopard and two sleeping lionesses. 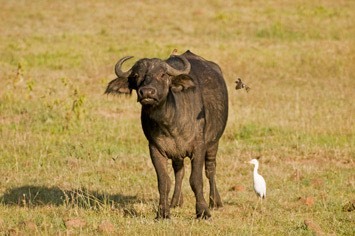 This meant that we had seen four of the “Big Five” in the first two days of our safari! 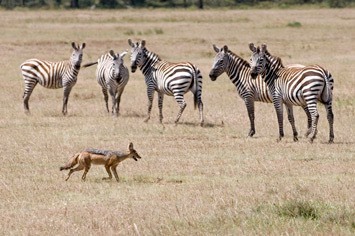 Maren, for whom it was the first safari in East Africa, couldn’t quite believe that it was possible to get so close to all these wild animals! 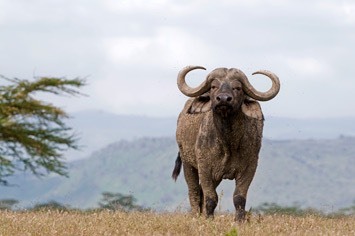 As the drive from Nakuru to Samburu National Reserve would take most of the day, we packed up camp early in the morning, and did a last game drive on the way to the park gate. 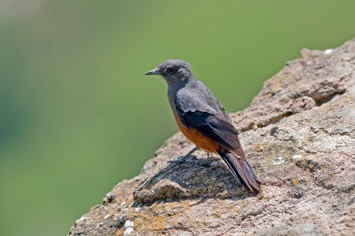 After leaving the town of Nakuru, we had to climb up the escarpment of the Rift Valley again. Our heavily-loaded car was not happy at all, and struggled all the way up at a very slow speed. The area is heavily populated and we drove past many tea and coffee plantations. Throughout the day, we crossed the equator several times, ending up in the northern hemisphere. For most part, the road was sealed with tarmac, but the quality of the tarmac was more than questionable in places! Some parts of the road were quite wide, and others were rather narrow and full of potholes. The potholed sections were especially stressful to drive, as all vehicles simply try to find the best way around the potholes, be it on their side of the road or yours! We also met several big army trucks, whose drivers didn’t care at all about any other cars on the road or whether they had the right of way. In order to avoid one of these trucks, Mick even had to pull right off the road at the last minute! Fortunately, he managed to do this without rolling the car over. It certainly was quite a scary moment! Throughout the day we had to pass several police control posts, but usually we were waved right through when the policemen realised that we were muzungus. 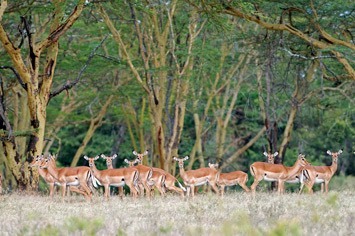 Some of them wanted to chat with us, and one even wanted to accompany us all the way to Samburu. He told us that we shouldn’t come back to his post until we had touched the nose of a lion. Could you imagine a policeman saying something like that in northern Europe? The last stretch to Samburu was on a sandy piste, parallel to the new road that was being built by the Chinese but was not yet entirely finished. At one point we came to a very soft sandy section, so Mick sped up to get us safely through. However, there was a large hidden hole there, and suddenly we found ourselves airborne! When we landed again in a vast explosion of dust, with the car still in one piece, we all broke out into hysterical laughter. After seven hours of driving we arrived at the gate of Samburu National Reserve, and even here we still had nearly one hour’s driving ahead of us to get to the public campsite. On the way we had already clocked up the first of the “Samburu Five”, species that live in the arid northern areas of Kenya: Reticulated giraffe, Grevy’s zebra and gerenuk. 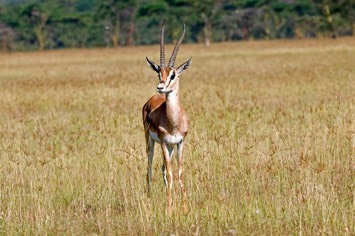 The latter are the same size as other gazelles, but with matchstick-like legs and very long necks, so that they can reach leaves higher up in the trees. And we even saw the first of the long awaited elephants, albeit only one rather far away. 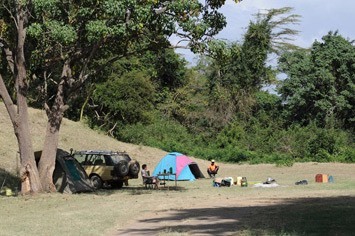 The public campsite is set under tall, shady trees on the banks of the Ewaso Ngiro River. As we were again the only campers, we picked a nice spot, not too far from the showers and toilets (which have big wooden seats here!). 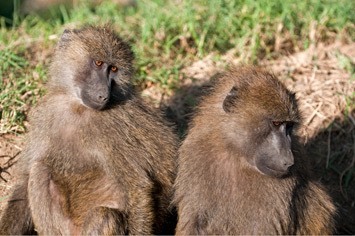 The campsite is well known for its thieving baboons, so we hired John, a local Samburu, to help Charles keep them at bay.